Why is it important to maintain my septic system? A key reason to maintain your septic system is to save money! Failing septic systems are expensive to repair or replace, and poor maintenance is often the culprit. Having your septic system inspected (at least every 3 years) is a bargain when you consider the cost of replacing the entire system. Your system will need pumping every 3 to 5 years, depending on how many people live in the house and the size of the system. An unusable septic system, or one in disrepair, will lower your property? value and could pose a legal liability. Septic system failures also can be a source of E. coli, which can lead to kidney failure and death in children and the elderly. But even ordinary days can pose problems. Doing too much laundry on a single day can overtax a system. Roots of trees near tanks can block field lines. Driving over septic systems or covering them with hard surfaces, such as concrete patios or asphalt driveways, can damage lines and limit evaporation. Washing chemicals down the sink can kill bacteria needed to break down sewage. How often should I have my septic pumped out? 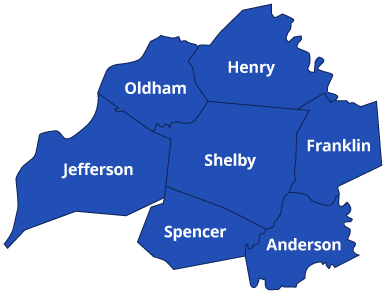 The Metropolitan Kentucky Water Planning District, a state agency created to establish water-use guidelines for 16 Metro Kentucky counties, recommends homeowners pump out septic tanks every three to five years, depending on the occupants of the home. See the “residential” portion of this website to see the data. An underground tank separates wastewater from solid waste, which is stored and broken down by bacteria. The partially treated water exits through perforated pipes called field lines and is absorbed and filtered by the soil. A typical drain field pipe is 4 inches (10 centimeters) in diameter. The gravel fills the bottom 2 to 3 feet of the trench and dirt covers the gravel. The water is slowly absorbed and filtered by the ground in the drain field. 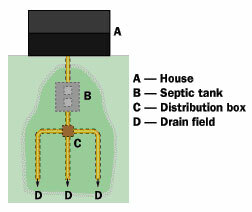 The size of the drain field is determined by how well the ground absorbs water. In places where the ground is hard clay that absorbs water very slowly, the drain field has to be much bigger. A septic system is normally powered by nothing but gravity. Water flows down from the house to the tank, and down from the tank to the drain field. It is a completely passive system. What should I NOT flush down my sink or toilet? ultra-thick brands of toilet tissue contribute to the semi-solid scum layer at the top of the septic tank. It swells in wastewater and can flow out to clog drainfield lines. garbage disposal grinds which substantially increase the accumulation of solids. ? disposal of items not biodegradable in the system (plastics etc.). disposal of excessive amounts of grease and fats, which are biodegradable but need particular types of bacteria to digest them. disposal of cigarette butts, Q-tips, and sanitary napkins which are also biodegradable but are not readily decomposable. household chemicals such as bleach, detergents, caustic drain openers that overrun and actually destroy the natural bacteria necessary in breaking down organic waste in a septic tank. Should I put any chemical additives into my septic system? Virtually every system can benefit from the addition of regular monthly treatments of anaerobic, facultative bacteria. These active combination of four (4) non-toxic, non-acidic, biodegradable bacteria (Lipase, Protease, Amylase, and Cellulase) eliminate odors and work to liquify organic solids and break down grease. Other chemicals can become necessary to treat root intrusions into drain and field lines. Shelby Septic recommends professional-grade additives that are only available through licensed septic companies. Please see our specials for ALL your maintenance needs.